Gurmukh is a world-renowned yoga teacher who has taught Kundalini yoga to people from all walks of life. She studied under Yogi Bhajan, and has been teaching and practicing Kundalini yoga for close to 40 years. In that time she has truly lived up to her name, “Gurmukh,” which means “One who helps people across the world ocean.” Whether you’re looking for a powerful yoga set, information and meditations to prepare for childbirth, or a great introduction to the practice of Kundalini yoga, Gurmukh is a fantastic teacher for you! But don’t think you have to move to California to study with her – these books and dvds are fantastic resources to help you practice Kundalini yoga with Gurmukh right at home! This brand new dvd was recorded at Sat Nam Fest East in 2011, and gives you all the benefits of a class taught by Gurmukh in the comforts of your own home. You’ll experience a class for the lymph system, which will strengthen your body and improve your circulation. Gurmukh is accompanied musically by Snatam Kaur, Ramesh Kannan, and Thomas Barquee, who provide a beautiful support system for your practice. 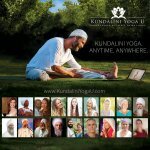 Whether you’re a Kundalini yoga pro or a total beginner, you will definitely benefit from this incredible DVD. Recorded at the first Sat Nam Fest (then called Spirit Fest), this dvd contains a class which will detoxify your body and build your immunity. Gurmukh’s energy is infectious, and the uplifting music provided by Snatam Kaur, GuruGanesha, Ramesh Kannan, and Ram Dass will keep you going throughout the practice. This DVD is also incredible in its ability to capture the group energy of a live class, and you’ll be able to keep up with ease. Gurmukh has taught with Snatam Kaur many times, and the energy of support and respect that these two women share is part of what makes classes with the two of them so special. On Snatam Kaur’s track “Hallelujah,” you’ll hear Gurmukh’s voice guiding you. If you’re practicing Kundalini yoga at home, this track would be a great source of inspiration and encouragement on your yoga playlist. Gurmukh is well known for her work with pre- and post-natal yoga, and this DVD captures that so well. Designed to support women in a prenatal sadhana practice, this DVD contains Japji, a yoga set safe for all levels, mantra meditations, and information for creating a beneficial sadhana practice. The scenery is beautiful, and the information Gurmukh gives is very useful for women preparing to bring a child into the world. This book is an indispensable resource for mothers-to-be. In it you’ll find meditations, yoga sets, and stories designed to prepare your body and mind for the joys and challenges of pregnancy, labor, and beyond. The wealth of information and wisdom make this book a must have for any woman who plans to become a mother. In this yoga DVD, perfect for beginners to Kundalini yoga, Gurmukh explains some of the basic principles of yoga and the chakras. There is a great warm up, an aerobic yoga set, seated meditation, and a gong meditation during the final relaxation. This DVD is great for those who don’t have much experience with yoga, and also those who want a refresher in the essentials of Kundalini yoga. In this book, Gurmukh provides all of the information and tools one might need to improve their body and mind with Kundalini yoga. Fully illustrated, and with step-by-step instructions, it’s a great resource for anyone who has even a few minutes a day, and wants to increase their health, vitality, and prosperity.